Jaco Pastorius is not dead. His big band played at the Hollywood Bowl last night and he created Weather Report 2.0. The self-described “world greatest bass player” Jaco Pastorius has been gone for now over 28 years and last night he came back and created Weather Report 2.0 and the born again Word of Mouth big band. 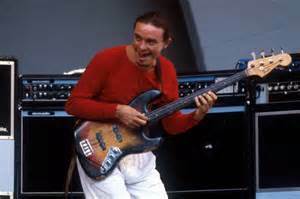 In my opinion, Jaco came back for one night at the Hollywood Bowl through his son Felix Pastorius and the original music he wrote for his Word of Mouth big band. The band was hard hitting and nocked the audience out. Peter Erskine played drums like he was twenty-one years old and put the band over the top. Herbie Handcock was the perfect MC and Vince Mendoza was the perfect conductor for the job. The stage was full of bass players and that’s what it took to do a Jaco’s World concert at the Hollywood Bowl. Here is my pick for the new Weather Report 2.0 Band. Can you believe that all of these musicians came out to play Jaco’s music at the Hollywood Bowl? Now we need someone to keep this band together. You all missed the jazz concert of the year. However, there is a new documentary coming out about Jaco that is being produced by Robert Trujillo. My vote for the most outstanding player of the concert was Peter Erskine on drums. Peter brought his “A” game to the big band. Wayne Shorter and Alex Acuna were high vote getters. Principal bass player Will Lee won best six-man award. He is sure the hardest working bass player. Herbie Hancock won best MC award. Take the time to learn more about Tierney Sutton. She could be the next big thing in jazz vocals. Jaco’s World needs to be at the Hollywood Bowl in 2016. The word is out, this was a fantastic concert and the promoters need help getting the word out. However, the future of America Jazz is still in trouble; I could not find any kids in the audience. Where are the future jazz players going to come from? Help to keep jazz alive in the schools and vote to get a photo of Jaco on US Postage Stamps. See you at the Hollywood Bowl next year! Kids Talk Radio News: We are working on the “Occupy Mars Learning Adventures.” You can think of it as a “War of the Worlds” production with jazz, world music and classical music with modern day storytellesrs. Bob Barboza has composed the orgianal music and stories. He is now looking to join other storytellers, writers and composers.